Tap in to the best of Public Health. At this event Charlene McGee, Deputy Refuge Health Coordinator at the Multnomah County, will introduce the topic of Racism & Public Health in Oregon. Afterwards, facilitated by our faculty, we invite our students for an open mic to tell a personal story or a call to action. Students can express themselves in any creative way, through either song, dance, a children’s book, poems, art or a TED talk style talk! This event is facilitated by the OHSU-PSU School of Public Health. 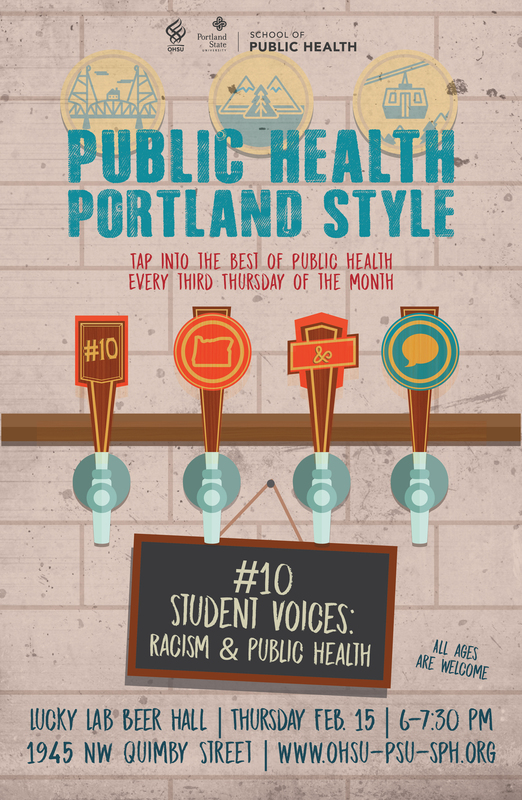 For this month’s Public Health Portland style we ask our audience to consume alcoholic beverages outside the venue in the bar area. Given the association of alcohol with acts of racial violence, the deliberate marketing and positioning of alcohol to and within communities of color, and the collective inattention within public health to intergenerational trauma within native and indigenous communities as a precursor to alcohol abuse, all represent–both empirically and symbolically–significant reasons for uncoupling discourse/discussion of racism with consumption of alcohol.